filling grow bags with soil and other substance for organic farming, potting mixture making and fill the same in grow bags for cultivating vegetables. we have already discussed about grow bags, all knows the usage of grow bags. we can now check grow bag filling and what substance we can use. soil is the main filling substance for grow bags, we can mix soil with other materials. use only upper layer soil, that contains more fertilizer parts. clean soil and remove hard elements like plastics pieces etc. its better to put soil 1 week under hard sunlight, it will better. you can spread Quick-lime over the soil for 1-2 weeks, it’s good for reducing soil acidity. you can mix dried leafs with soil, it will reduce the amount of soil and good for vegetables. put a handful of neem cake with soil, it will help to protect attacks from soil. its better to avoid chemical fertilizers in grow bags. if vermicompost (click here to purchase it online) is available we use the same for filling grow bags. soil, dried leafs, neem cake, vermicompost all mix well and fill in grow bags. don’t use pressure to fill the mixture don’t full fill it. just fill 3/4 portion of grow bags, if you full fill its difficult to apply water and organic fertilizers later. we can also use coco peat for filling grow bags, its a good idea to use this. there are lot of benefits with coco peat. it will absorb more water and we can reduce the watering in vegetables. we can mix coco peat with soil mixture and use the same. if soil is not available coco peat can be use instead of the same. 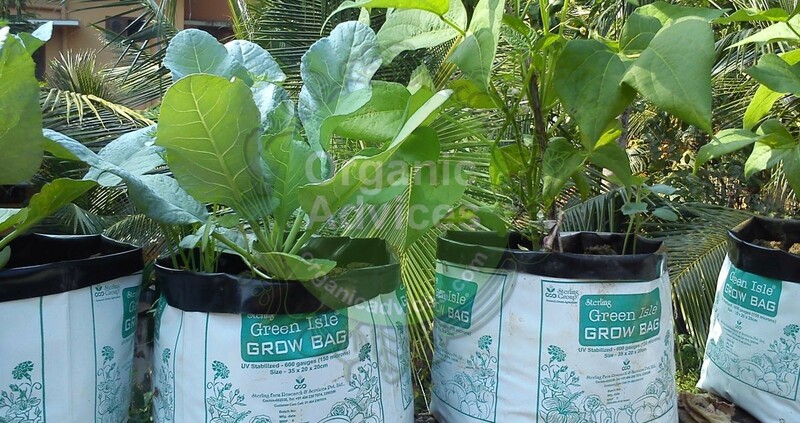 its better to use only organic pesticides and fertilizers in grow bags. if you have any doubts about grow bags and filling materials drop a comment here. What is dolomite and how to use it? How much quick-lime (chunnabu) to be used per grow bag. Enter your email address to subscribe to organicadvices.com and receive notifications of new posts by email. Once You subscribed to us you will all the latest articles in your inbox. This Online Web portal is dedicated portal for terrace gardening using organic methods. We are publishing articles related with organic farming. you can check vegetable growing tips and methods from here. we will guide you to make organic pesticides and fertilizers.